It can be worn as a shoulder bag or as a pochette for a trendy cocktail! I am happy: I got good reactions from My new vintage style bag so I decided to design another version of it. This time, no metallic frame to make it more simple but instead a cute little flap. 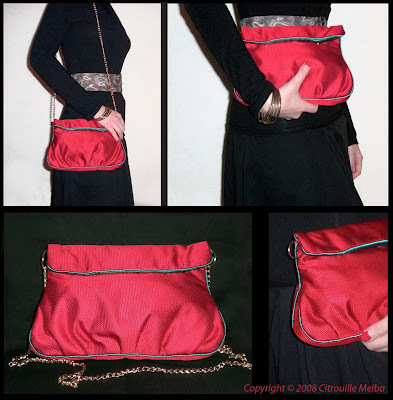 The fabric I used is silk, so that it can be a cool evening bag! I also used a contrasting peacock green (mmm I love this colour...) for the lining. And last but not least, my favourite detail: piping!!! Once again, it was too difficult finding interesting varieties (I think I give up for now...), so I decided to make my own with the same fabric as the lining. I had the instructions of this sewing bible on how to make tubing and after a few modifications, I came up with my own piping tutorial. It is great fun to make! pfffiou, what an adventure!!! So,no French version for the moment for my French friends I am afraid ! I will try to make one very soon. 1. Cut bias strips in your chosen fabric. To find the true bias, fold fabric at a 45 degree angle to selvage. 2. I find it easier to trace a pattern, it avoids me to struggle with the fabric later:) You know how silky fabrics and lining have a mean tendency to slip in your hands when you’re trying to cut into them!!! In any case, measure the diameter of you piping cord (any cord you like, can be found in any haberdashery). Then, add 1 cm on each side for the seam allowance. It will make your life much more simple for when you sew! 3. Pin pattern on fabric and cut as much as you need. Because bias stretches; cut your cord twice as long. If you don’t have enough fabric, cut two stripes and sew them together as in the photos. If you iron well and seams open, it won’t show once it is around the cord. 5. Now for the fun bit, if you have a zipper foot, which I strongly recommend! (I tried with a normal foot and it is really a nightmare).The best is to get a double-sided zipper foot, so that you can use it either way! (if you live in the UK, check out this website). So, using a super zipper foot, stitch down the bias, as close as possible to cord. Et voila, you get your nice personalised piping tape!!! 6. Now for the sewing: it’s going to be so easy... Just pin piping tape on your sewing project, matching seam allowances and, again using zipper foot, stitch along cord. Finally, add second layer on top (your piping will be then “sandwiched” in between, and follow the previous sewing lines. Great tutorial and nice color combo for the bag! Write your post in Google Documents instead of Word. You can insert the pictures wherever you want. Then, when you're ready to post, just use the "Publish" link on the Google Docs toolbar and it will publish it right to blog - pictures, links, highlighted text and all. You can edit if needed in the Blogger editor, just like any other blog post. Je suis fière j'ai presque tout compris tes explications! Je n'aurais jamais imaginé fabriquer du passepoil! Je pensais qu'il fallait mettre du tube type scoubidou... impressionnant! Sinon, tes photos sont super claires, ça compense les lacunes en anglais... Et encore bravo pour ce modèle!